true love and muse of the greatest musician of the time. new songs and poems every night. That would have made me fall in love with him. her man went to Hades and back for her. Orpheus almost won her back. He was a step away and lost her forever. music moved him and his bitter queen. Music did what even other Gods couldn’t. Right before he was going to win the greatest battle ever waged. but was too impatient to wait just one more step. What about all that way he’d come? doesn’t that count for anything? (Nope). But it taught me something. Faith is a treacherous journey. That is when faith must be firmest. Orpheus’ journey is a lesson in faith. It warns us that the most treacherous part of the journey is that last length right before the prize. and it makes the most sense to give up. 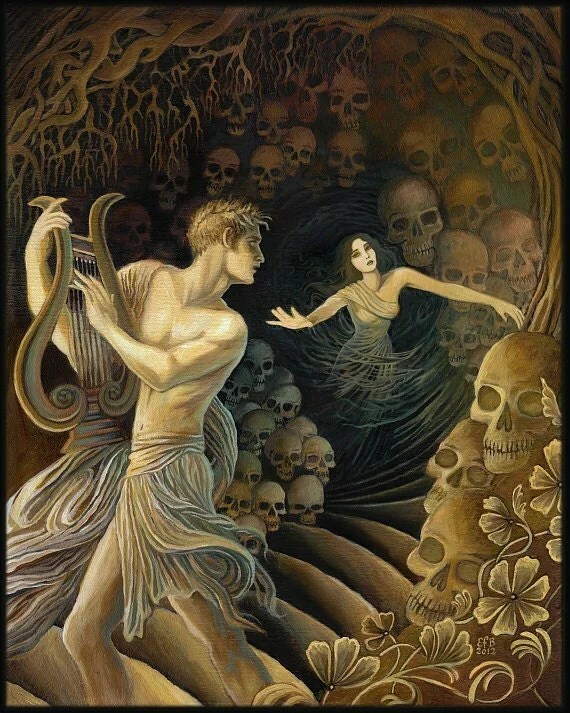 to think of poor Orpheus and why in the world such a downer of a story would ever be told. One I needed to be reminded of. It’s hardest at this moment. This is the most horrible part. But if you don’t get through this you’ll be back to your beginning and you’ve come too far to let fatigue and heartache win. Let the tragedy of Orpheus teach you something. I’m not judging the guy. Who am I to call him a fool? how do I know how that last foot step of his felt? I wasn’t in his shoes. But it teaches me something. We could loose all we’ve gained if we look back even once.